ATLANTA — Modern-day life keeps getting faster, but fast food is slowing down. In an industry that traditionally measures every second, wait times have soared over the last 15 years at quick-service restaurants. The culprit is the drive-thru — the line of choice for about 70 percent of hungry and often-rushed visitors to fast-food chains. Wait times there grew as customers demanded better, fresher foods and items more difficult prepare. “We’ve almost quit doing fast food because they are not fast food any more,” stay-at-home mom Michelle Hancock said as she idled her pickup at a McDonald’s drive-thru in Duluth, Georgia, waiting for a couple of cheeseburgers and fries. Hancock and her husband are eating out less often because of the costs and the growing time commitment. Purveyors of hamburgers, chicken sandwiches and milkshakes are scrambling to catch up, rethinking everything from how drive-thru operations are laid out to what workers say to customers or where they meet and serve them. Some staffers at Atlanta-based Chick-fil-A are now hustling outside not only to take orders but to deliver food, bypassing the drive-thru window. Chick-fil-A’s drive-thru times between ordering and receiving food are closing in on double its average in 2003. At 260.85 seconds last year, it ranked second slowest of 10 major chains studied, according to QSR magazine, a trade publication that clocks them annually. Industry giant McDonald’s was longest at 273.29 seconds, about two minutes slower than 2004. Wendy’s added nearly as much time and now sits at 226.07 seconds. Taco Bell, at 236.50, is about a minute and a half slower. Burger King, the speedster of the group at 193.31 seconds, is 40 seconds behind its decade-ago time. Those figures don’t include how long motorists wait before ordering — lines can stretch around buildings during crunch times. McDonald’s, the nation’s largest fast-food chain by revenue, said it can’t stomach any more after five years of increasing times. It’s adding technology to help staffers flag bottlenecks. “We expect to actually reduce service times across 2019,” Chief Executive Steve Easterbrook recently told analysts. Chains raced to make drive-thru service as fast as possible in the early 2000s, but order accuracy declined as a result, according to Sam Oches, editorial director of Food News Media, which publishes QSR. Consumers also wanted more menu offerings, adding complexity to food preparation and lengthening wait times. That’s despite juiced-up technology, improved kitchen design and more workers assigned to the drive-thru. It’s a tough balancing act. Valencia Sherman, a single mother, said she’s almost always racing against the clock to grab lunch and take care of errands on her midday break as an Atlanta child-care teacher. Still, “if I want the quality food, I wait,” she said. Chick-fil-A is adding windows and doors at some restaurants so staff can bring food to waiting vehicles more quickly. And it’s planning to attach removable shelves alongside the drive-thru so outside workers can stage food before hand-delivering it, said Khalilah Cooper, the director of service and hospitality. The chain is adding canopies with fans and heaters over drive-thru lanes to improve work conditions for the staffers stationed outside — all the while trying to ensure they feel safe while navigating around moving cars. 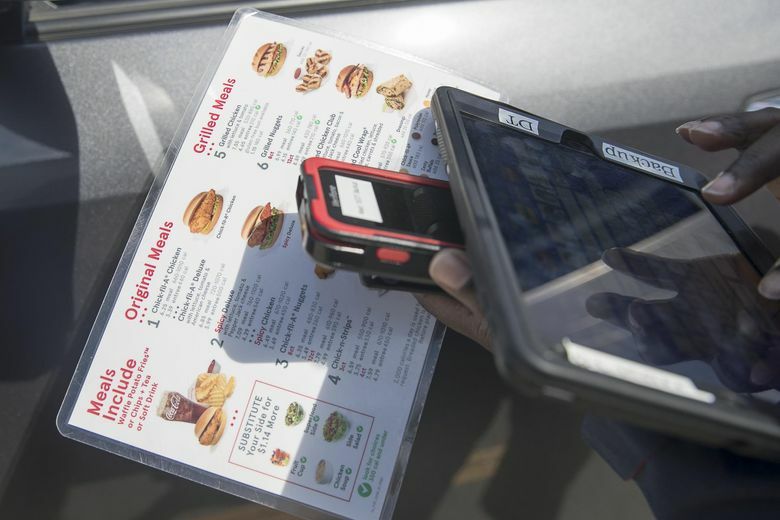 During a recent lunch rush at a Chick-fil-A on Northside Drive in Atlanta, restaurant operator John Diamond saw pending drive-thru orders highlighted in red on a kitchen monitor. They had slipped over the three-minute goal he set for service time. “We don’t want to be in the red,” he said. Lunchtime in the drive-thru is a daily symphony at the Northside Drive restaurant, with seven outside workers, including four order-takers spread out over two lines. Another member staffs an outside register. One carries orders to cars before they get to the takeout window. A co-worker is inside at the window — what they call the cockpit — handing out food. A manager is nearby directing motorists. Inside, more workers are glancing at the drive-thru clock, filling drinks and preparing meal orders that are bigger, and more sophisticated and customized than 20 years ago. That limited-time Frosted Key Lime lemonade? It took an extra 30 or 40 seconds to prepare. Other chains face the same pressures. The company built a “complexity model” to assess the time it takes to prepare every ingredient in every sandwich. The model helps company officials determine whether a sandwich is worth the commitment. That’s a big deal for a chain that dramatically expanded its menu from roast beef to include six different proteins, multiple breads and a lineup of limited-time items added every six to eight weeks. Krystal, the metro Atlanta-based chain that serves tiny, square burgers, has begun spending heavily to rebuild or renovate some restaurants. The restaurant reconfigured the food prep area to end beside the drive-thru window, and space was added to fit three workers there. Speed per order improved 20 to 30 seconds, which helped contribute to a 30 percent boost in sales, said Paul Macaluso, Krystal’s chief executive. McDonald’s rolled out the mobile-order option nationally in 2017. Customers order thru an app, park in designated spots at a restaurant, and the food is delivered to their car. But many in the industry want to prevent such changes from complicating navigation around the drive-thru lanes. The lines, they figure, already are long enough.